The eyewear industry has a new set of optics. The old model built on high priced opticians and retailers gave way to online brands like Warby Parker that curated an experience while still extracting a significant premium. Today direct-to-consumer brands like Zenni Optical have reframed the conversation, delivering exponential choice at dramatically lower price tags. While they’re now selling four million pairs a year, Zenni came to Salt for a far-sighted look at their proposition. This dictated the move from a functional economic pitch to a more emotional connection with their audience. And with a crowd of imitators ramping up, it was an ideal moment to evolve and strengthen their disruptor brand. Price is a simple calculation. In the case of Zenni, however, price creates a fundamentally new way to think about eyewear. When people can afford multiple pairs of glasses, suddenly, self-expression becomes a powerful and inviting story. We were able to crystallize this idea with a new statement for the brand: Eyewear For Every You. By elevating individuality and style, we transformed price into an empowering message of self-expression. 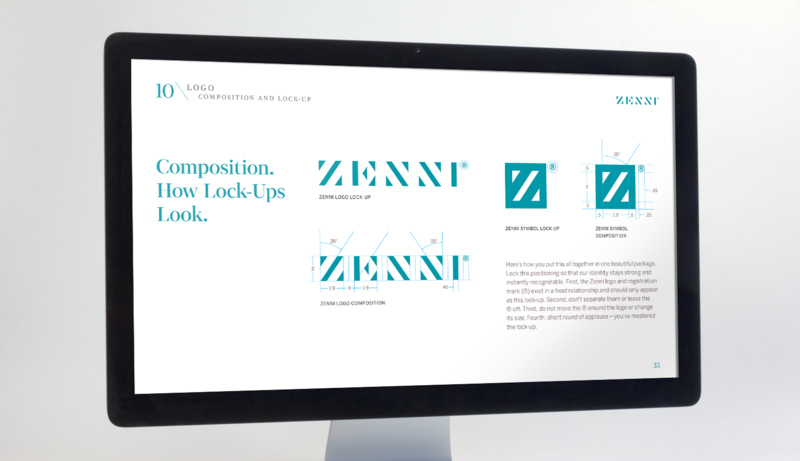 The design of the Zenni wordmark and logo reflected this switch to a richer brand experience. The look is fashion-driven and reinforces a strong sense of quality and craft – an important asset for eyewear at such a surprisingly low price. All elements of the system – from textural patterns and color palettes to typography and photography – help express the new positioning of personal style. While the visual language brought a new level of style and design sense, it’s important to note Zenni is a populist brand. In spirit and mission -- it’s Target, not Lord & Taylor. Salt developed a verbal identity and voice that was more lighthearted, inclusive and invitational. The Zenni message encouraged people to re-imagine eyewear from a fresh point of view. Out with expensive and elitist, in with affordable, engaging and fun. The entire brand came to life on the Zenni e-commerce website. Salt explored all ideas for how people would browse, try on frames virtually, fill their shopping carts and make personal profiles. 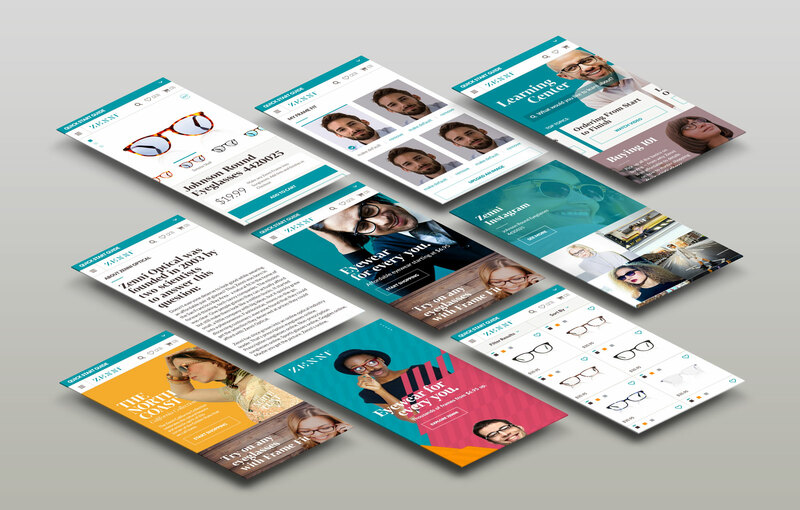 Buying prescription glasses online is a new idea, so we created a learning center to kickstart their education. Ultimately, all UX and UI work centered on building a stronger relationship with new customers and long-time fans. 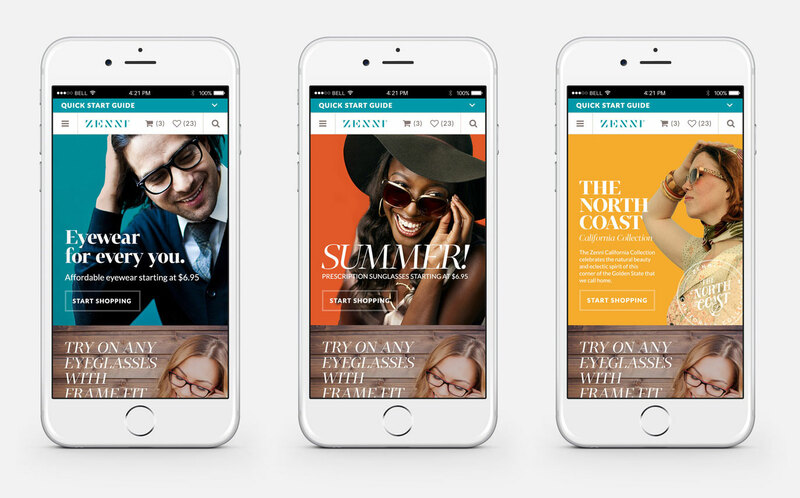 We also examined how we could rev up the retail experience. 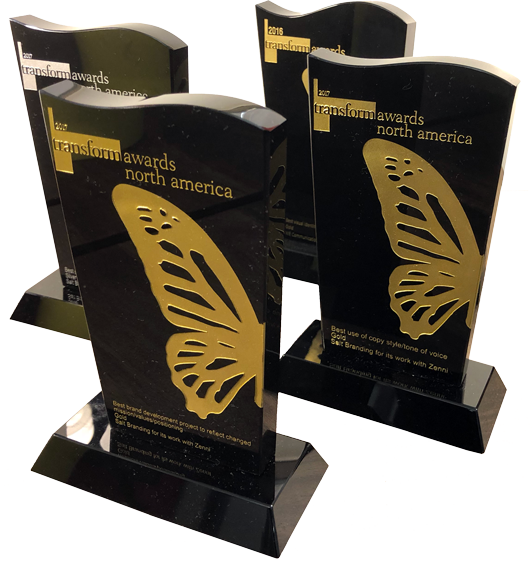 We helped develop a year round program of collections, sub-brands and seasonal promotion ideas that would keep the Zenni story fresh and relevant. An extensive set of seasonal color palettes brought a distinctive and energetic look to each month of the calendar. In taking a 360-degree view of the Zenni brand, we were able to unify all the touch points into one cohesive story. A company built on a price tag now has a compelling brand story that celebrates individual style and creative expression. A new trend in eyewear is the development of blue blocker lens. This technology filters out the harmful blue light from computer screens that can cause burning, irritated eyes. While most companies take a scientific or medical approach to telling that story, Zenni wanted something different. In keeping with their playful, engaging brand voice, we created Blokz (their proprietary lens tech) and presented it as the Cure for FryEye. As Zenni gains status and mass market appeal, sports sponsorships become a powerful medium to reach a diverse TV audience. 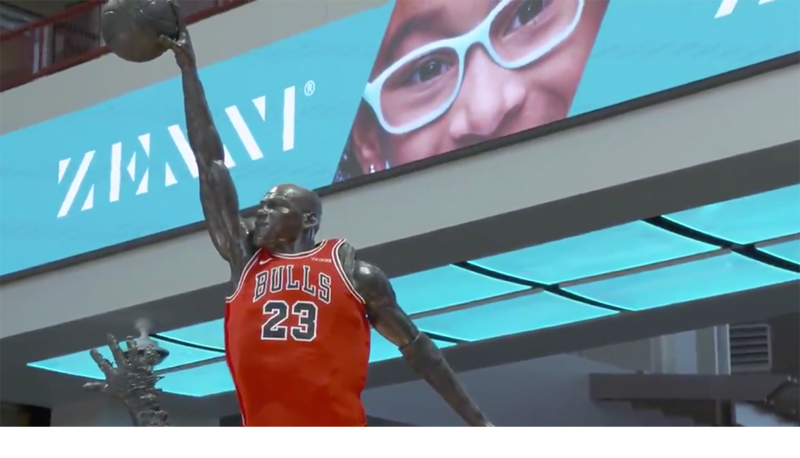 Zenni now partners with the NBA Chicago Bulls, bringing their eyewear story alive on the Bulls jerseys and throughout the arena. In a branding sense, Zenni got game. 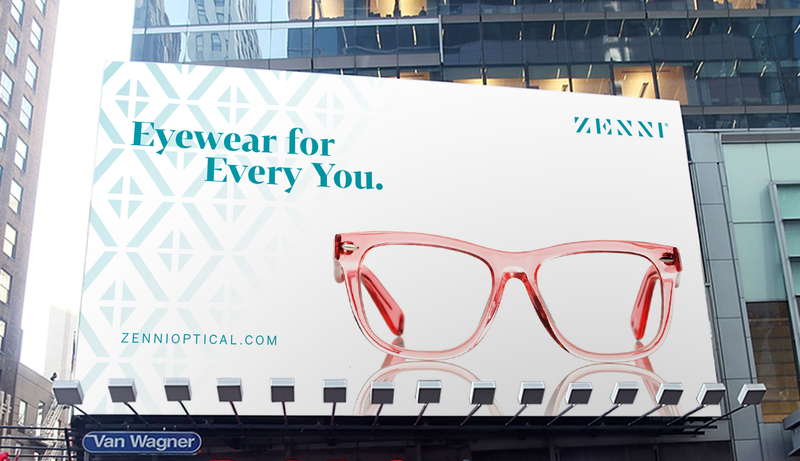 While Zenni is transforming the way people buy prescription eyewear, the imitators and rivals were closing the gap. By reframing the price story as a new way for people to think about eyewear, fashion and self-expression, Zenni once again rewrote the industry rulebook. This is a disruptor with staying power.